Wanting to know how your account is performing over time? 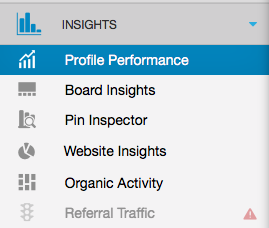 Head over to the Brand Profile Performance for Pinterest report to measure your core Pinterest metrics such as growth in Followers, Pins, and Repins for the last week. 2. By clicking on different metrics above the graph, you can see how your Followers, Pins, and Repins are growing over time. You can even hover over the graph with your cursor on any given day to get metrics for that specific day. Here’s one example of how you could use this report. This can be helpful if you notice that over time your graph for Repins is getting flatter. That means that you’re getting fewer Repins each day or week over time. You may want to check and see if this is a result of the number of Pins you publish going down in tandem by checking the Pins graph here too. This would be a good first step in trying to identify what could be happening before diving deeper into content insights on other reports. 3. Just below these core Pinterest metrics are your Virality Score, Engagement Score, and Engagement rate. If you’d like to know more about these scores, check out the Knowledge Base Article, "What Does Virality Score, Engagement Score, and Engagement Rate Mean?"